Our Feminism Must Be Intersectional Rally/March, Pittsburgh East Liberty Women's March 2017. Credit: Flickr/feral godmother. CC BY-NC-SA 2.0. She had obviously misheard me, but that didn’t matter. All that mattered was that I wasn’t quite sure what she was talking about yet I understood, on a visceral level, the underlying message and how it made me feel: small, ugly… less than. Since that unwitting attempt to “put me in my place,” I’ve endured countless scenarios — sometimes casual, sometimes hostile—that made me feel one or more of those things throughout my life, a consequence of navigating a white-dominated society with an anti-black value system woven into the tapestry of its white-oriented culture. The thing is, I’m not just Black: I’m also an atheist. While far more benign compared to anti-blackness, being an atheist tacks on a more uncommon layer of prejudice that I contend with given our Christian hegemonic society, even within the Black community. Since most are reared in a social environment that constantly encourages and reinforces some type of religious or theistic belief, many view these normative ideas as being identical to truth. This view results in thinking something traumatic must have happened to those who reject these normative beliefs, or that they must hate god (which is misotheism, not atheism), or that there must be something wrong with them mentally—because, somehow, we’ve been conditioned to believe that no sane individual would reject the idea of an invisible yet omnipresent supernatural being we’ve never seen and are only familiar with through primitive stories and hearsay. But I’m not just an atheist. I must deal with a wide range of animus, fear, bias, ignorance, microaggressions, alienation, and erasure reserved not just for atheists, and not just for Blacks, but for the intersection of blackness and atheism. I’ll always be an outspoken atheist as well as unapologetically Black (that is, I despise respectability politics, readily speak to the real-lived texture of Black life, and choose to not diminish issues disproportionately impacting Black America). Thinking deeply about this also helped shape my appreciation of the ways I hold many social advantages as an able-bodied, cisgender, heterosexual male in a society that confers a surplus of meaning to those occupying these identities while delegitimizing the humanity of those who do not. So, for me, the reason why intersectionality is vital is apparent: it’s both a metaphor and frame of understanding that acknowledges multiple “avenues” of prejudice and marginalization exist, and that these “avenues” intersect. Intersectionality reminds us to consider how we are all impacted differently due to the complex, intersecting nature of social power dynamics. Still, there remain many who disparage or otherwise question the need for intersectionality. This usually happens for three reasons. 1. Naysayers don’t understand identity or its impact on our shared social reality. When discussing common identity—separate from individual identity—we’re describing what’s imposed on us by an established history of social standards, stratification, controlling images, and stereotypes. She’s also articulated how intersectionality helps us increase attentiveness to identity-based “blind spots” when it comes to aspects of unequal social power dynamics we don’t ourselves experience. Basically, “identity politics” is used as an expression to identify political deviance — to describe political actions defying imbalanced political structures we’ve been conditioned to accept. If the phrase has any value at all—and it really doesn’t—“identity politics” calls attention to the ways that people from majority groups, especially White people, do not “see” how their identities are governed by politics. They’ll go to great lengths to invalidate missions for increased social and political power by those from marginalized social groups—communities systematically disenfranchised in ways that restrict access to resources, rights, or opportunities made fully available to other social groups. In 1977, a Black feminist lesbian organization known as the Combahee River Collective issued a statement that may be considered the historical genesis of explicit identity politics. In it, the group expresses the relevance of identity to politics and how shared aspects of identity produces solidarity when confronting unique forms of oppression that target specific identities. The group was formed after issues related to their particular life circumstances were continually disregarded due to pervasive heterosexism, erasure within the white-dominated women’s movement, and erasure within the male-dominated Black liberation movement. For marginalized social groups, what is perceived as explicit identity politics is a challenge to status quo, and used as a means of seeking increased sociopolitical power currently not being distributed in an equal or just manner. This form of political engagement—which emphasizes issues and perspectives relevant to shared aspects of an identity— erves to address social ills that disproportionately impact the lives of marginalized social groups in clear and specific ways. A laser focus on matters related to our own social positions breeds insularity and complacency, obstructing our emotional and intellectual connection to disparate social realities we don’t experience. This is why we need intersectionality—to challenge and expand that narrowed focus. 3. Naysayers don’t want seismic social change. When you’re socially and politically exempt from systemic inequality, it isn’t unusual to focus on matters that relate more to your vantage point and to greet treating matters that decenter your purview with indifference, defensiveness, bewilderment, or hostility. We’ve all been socialized within a profoundly oppressive culture wherein widely accepted social mores cater to dominant social groups, whether based on gender, class, race, sexuality, ability, religion, or a combination of these and more. 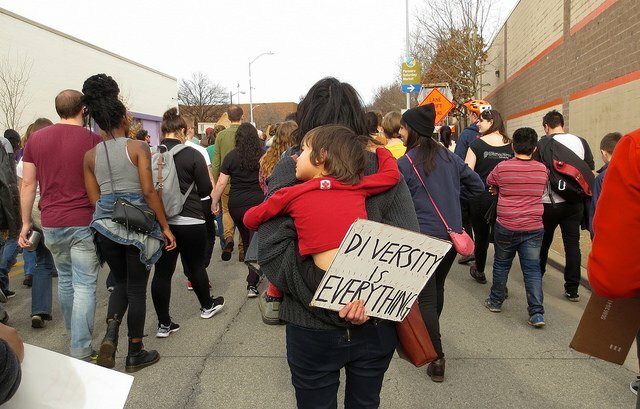 The exercise of intersectionality intervenes on the everyday assumptions, expectations, and interests we uncritically accept that routinely eclipse the concerns of marginalized communities. For the sake of realizing a society more inclusive of the disadvantaged and the underrepresented so that increased access to well-being and autonomy is possible, it’s vital we take advantage of an analytical tool that deliberately seeks out those who exist on the margins. And that tool is intersectionality. This article was first published on The Establishment.